Opening a new restaurant is exciting. However, designing a new restaurant can be overwhelming for a first-time owner. The design of your restaurant should align with its theme. You will need to consider the atmosphere and the seating, as well as the location of your kitchen. There are other issues to consider, such as fire codes, ventilation, and other building codes. Here are the basics to help you get started. The center of any restaurant is its dining room, which should be welcoming and comfortable. It's where customers gather to enjoy a good meal and each other's company. You should check with the local fire code marshal or other authority about the seating capacity of your dining room. Once you know how many people you can safely serve at one time, you can plan where to place tables and chairs, as well as a wait station. Before your opening day, take a moment to sit in every seat to assess the view and decide if the table needs to be repositioned for a better experience. The heart of a restaurant is its kitchen. 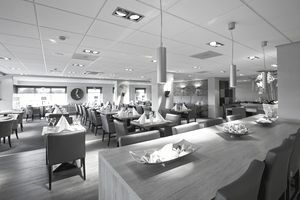 Even though most commercial kitchens are not in view of the public, the layout is just as important as the dining room. The size of the kitchen and the type of food you are serving will dictate the kitchen layout, as well as the type of commercial equipment that will need to be purchased. If you plan to have a full service bar in your restaurant, one that customers can sit at for drinks and a meal, it should be just as welcoming as your dining room. The bar should also be functional for the restaurant, as it is where servers place and pick up drink orders for their tables. Make sure that restrooms are included in the overall restaurant design plan. Restaurants usually occupy a small space, so it’s easy to dress up restrooms and give them some character without overspending. The most important part of a restaurant's restrooms is cleanliness. Cleaning the restrooms periodically throughout the day will indicate that your restaurant is clean, a major concern to patrons. If you are fortunate to have an outdoor dining space, such as a deck or patio, make sure your restaurant theme also extends to that area. Sturdy outdoor tables and chairs should be provided. Planters and small fairy lights can add additional ambiance. If the view from your outdoor dining area is a parking lot, for example, consider building a lattice wall with some climbing plants or other visually appealing divider. Also, be sure to include umbrellas or awnings, which are vital during the hot summer months for customer comfort. If you have the space for a waiting area, be sure to have benches or chairs for customers. Also keep some menus nearby, so they can peruse them as they wait. This is also a good place to display a bulletin board of other events at your restaurant, such as wine tastings, weekly specials, and happy hours. Depending on the type of restaurant, you may want to designate an area for coats. A more upscale restaurant may provide a coat check with a staff member hanging up coats and giving numbers to patrons. However, a less expensive steak house may provide coat racks or hooks near each customer booth. No matter what your theme or concept, a new restaurant should have a well-planned design for the dining room and kitchen. Every part of your restaurant design should work together to create a unique experience that will keep customers coming back.